Hatters midfielder Pelly Ruddock Mpanzu has been named in the starting line-up for Luton Town’s Final Third Development League clash against AFC Wimbledon at Hitchin Town this afternoon. The 23-year-old, who was on the bench for Town’s 1-0 defeat against Crawley on Saturday, is one of a handful of first team squad members selected, alongside Magnus Okuonghae, Elliot Justham and Zane Banton. Recently turned pros James Justin and Tareeq Bakinson are involved, along with Charlton Athletic loanee Joe Pigott too, with Luton, as boss Nathan Jones promised would be the case, naming a number of their talented U18 players in the team. 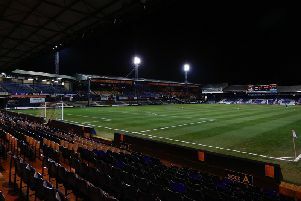 Hatters: Elliot Justham, Luke Trotman, Cameron McJannet, Tyreeq Bakinson, Magnus Okuonghae, Akin Famewo, Alex Atkinson, James Justin, Joe Pigott, Pelly Ruddock-Mpanzu, Zane Banton. Subs: Isaac Galliford, Liam Gooch, Kavan Cotter, Jack Snelus, Kyran Mcghan-George.